Onshoring of IP to Ireland rather than the UK has become a “dividend” of the Brexit process, the managing partner of Irish law firm Matheson has said. Michael Jackson told an audience of Irish CEOs at the IBEC Business Leaders’ Conference in Dublin that there were increasing signs that more companies were now looking for locations to onshore their IP that had supportive business environments and where they already had substantive investments. For many companies, he said, Ireland ticked both boxes. However, he added, the Government must ”continually review and update” the legal framework for intangible assets so that it is “fit for purpose”. 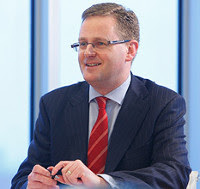 Mr Jackson (pictured) said: “Ireland is increasingly becoming the location of choice for companies looking to onshore their IP as it has a supportive business environment and is a location with substantive tangible investments already located here for many of the companies involved. There has been a noticeable move over the last couple of years for more companies to choose Ireland ahead of the UK for such moves, in part at least, because of the issues surrounding Brexit. “Connected to this trend regarding the onshoring of IP is the need to continually ensure that our legal and regulatory framework is fit for purpose given the strategic importance of the issue.